THIS SERMON was preached by Charles Spurgeon at the Royal Surrey Gardens Music Hall on Sunday morning, December 5, 1858. 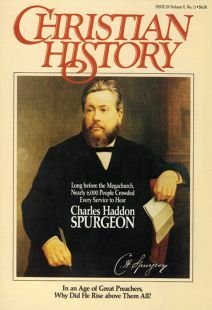 The hall was a popular public amusement hall capable of holding 10–12,000 people, and Spurgeon drew not only religious people, but also thousands of curious onlookers. His message, which is lightly condensed here, was based on Luke 14:23. The original punctuation has been retained. Here then, O ye that are strangers to the truth as it is in Jesus—hear then the message that I have to bring you. Ye have fallen, fallen in your father Adam; ye have fallen also in yourselves, by your daily sin and your constant iniquity; you have provoked the anger of the Most High; and as assuredly as you have sinned, so certainly must God punish you if you persevere in your iniquity, for the Lord is a God of justice, and will by no means spare the guilty. But have you not heard, hath it not long been spoken in your ears, that God, in his infinite mercy, has devised a way whereby, without any infringement upon his honour, he can have mercy upon you, the guilty and the undeserving? To you I speak; and my voice is unto you, O sons of men; Jesus Christ, very God of very God, hath descended from heaven, and was made in the likeness of sinful flesh. Begotten of the Holy Ghost, he was born of the Virgin Mary; he lived in this world a life of exemplary holiness, and of the deepest suffering, till at last he gave himself up to die for our sins, “the just for the unjust, to bring us to God.” And now the plan of salvation is simply declared unto you—“Whosoever believeth in the Lord Jesus Christ shall be saved.” For you who have violated all the precepts of God, and have disdained his mercy, and dared his vengeance, there is yet mercy proclaimed, for “whosoever calleth upon the name of the Lord shall be saved.” . . . “Whosoever cometh unto him he will in no wise cast out, for he is able also to save unto the uttermost them that come unto God by him, seeing he ever liveth to make intercession for us.” Now all that God asks of you—and this he gives you—is that you will simply look at his bleeding, dying son, and trust your souls in the hands of him whose name alone can save from death and hell. First, I must find you out; secondly, I will go to work to compel you to come in. But especially I must speak to you who are poor, spiritually. You have no faith, you have no virtue, you have no good work, you have no grace, and what is poverty worse still, you have no hope. Ah, my Master has sent you a gracious invitation. Come and welcome to the marriage feast of his love. “Whosoever will, let him come and take of the waters of life freely.” Come, I must lay hold upon you, though you be defiled with foulest filth, and though you have nought but rags upon your back, though your own righteousness has become as filthy clouts, yet must I lay hold upon you, and invite you first, and even compel you to come in. There is yet another class. You are halt. You are halting between two opinions. You are sometimes seriously inclined, and at another time worldly gaiety calls you away. What little progress you do make in religion is but a limp. You have a little strength, but that is so little that you make but painful progress. Ah, limping brother, to you also is the word of this salvation sent. Though you halt between two opinions, the master sends me to you with this message: “How long halt ye between two opinions? if God be God, serve him; if Baal be God, serve him.” Consider thy ways; set thine house in order, for thou shalt die and not live. Because I will do this, prepare to meet thy God, O Israel! Halt no longer, but decide for God and his truth. And yet I see another class,—the blind . . . . You, blind souls that cannot see your lost estate, that do not believe that sin is so exceedingly sinful as it is, and who will not be persuaded to think that God is a just and righteous God, to you am I sent. To you too that cannot see the Savior, that see no beauty in him that you should desire him; who see no excellence in virtue, no glories in religion, no happiness in serving God, no delight in being his children; to you, also, am I sent. Ay, to whom am I not sent if I take my text? For it goes further than this—it not only gives a particular description, so that each individual case may be met, but afterwards it makes a general sweep, and says, “Go into the highways and hedges.” Here we bring in all ranks and conditions of men. . . . This is the universal command—compel them to come in. . . .
II. And now to the work—directly to the work. Unconverted, unreconciled, unregenerate men and women, I am to COMPEL YOU TO COME IN. Permit me first of all to accost you in the highways of sin and tell you over again my errand. The King of heaven this morning sends a gracious invitation to you. He says, “As I live, saith the Lord, I have no pleasure in the death of him that dieth, but had rather that he should turn unto me and live”; “Come now and let us reason together saith the Lord, though your sins be as scarlet they shall be as wool; though they be red like crimson they shall be whiter than snow.” Dear brother, it makes my heart rejoice to think that I should have such good news to tell you, and yet I confess my soul is heavy because I see you do not think it good news, but turn away from it, and do not give it due regard. Permit me to tell you what the King has done for you. He knew your guilt, he foresaw that you would ruin yourself. He knew that his justice would demand your blood, and in order that this difficulty might be escaped, that his justice might have its full due, and that you might yet be saved, Jesus Christ hath died. Will you just for a moment glance at this picture. You see that man there on his knees in the garden of Gethsemane, sweating drops of blood. You see this next; you see that miserable sufferer tied to a pillar and lashed with terrible scourges, till the shoulder bones are seen like white islands in the midst of a sea of blood. Again you see this third picture; it is the same man hanging on the cross with hands extended, and with feet nailed fast, dying, groaning, bleeding; me thought the picture spoke and said, “It is finished.” Now all this hath Jesus Christ of Nazareth done, in order that God might consistently with his justice pardon sin; and the message to you this morning is this—“Believe on the Lord Jesus Christ and thou shalt be saved.” That is trust him, renounce thy works, and thy ways, and set thine heart alone on this man, who gave himself for sinners. Well brother, I have told you the message, what sayest thou unto it? Do you turn away? You tell me it is nothing to you; you cannot listen to it; that you will hear me by—and—bye; but you will go your ways this day and attend to your farm and merchandise. Stop brother, I was not told merely to tell you and then go about my business. No; I am told to compel you to come in; . . . You may despise your own salvation, but I do not despise it; you may go away and forget what you shall hear, but you will please to remember that the things I now say cost me many a groan ere I came here to utter them. My inmost soul is speaking out to you, my poor brother, when I beseech you by him that liveth and was dead, and is alive for evermore, consider my master’s message which he bids me now address to you. But do you turn away and say you will not be commanded? Then again will I change my note. . . . My brother, I come to you simple of speech, and I exhort you to flee to Christ. O my brother, dost thou know what a loving Christ he is? Let me tell thee from my own soul what I know of him. I, too once despised him. He knocked at the door of my heart and I refused to open it. He came to me, times without number, morning by morning, and night by night; he checked me in my conscience and spoke to me by his Spirit, and when, at last, the thunders of the law prevailed in my conscience, I thought that Christ was cruel and unkind. O I can never forgive myself that I should have thought so ill of him. But what a loving reception did I have when I went to him. I thought he would smite me, but his hand was not clenched in anger but opened wide in mercy. I thought full sure that his eyes would dart lightning-flashes of wrath upon me; but, instead thereof, they were full of tears. He fell upon my neck and kissed me; he took off my rags and did clothe me with his righteousness, and caused my soul to sing aloud for joy; while in the house of my heart and in the house of his church there was music and dancing, because his son that he had lost was found, and he that was dead was made alive. I exhort you, then, to look to Jesus Christ and to be lightened. Sinner, you will never regret it. . . . The trials of Christian life you shall find heavy, but you will find grace will make them light. And as for the joys and delights of being a child of God, if I lie this day you shall charge me with it in days to come. If you will taste and see that the Lord is good, I am not afraid but that you shall find that he is not only good, but better than human lips ever can describe. I know not what arguments to use with you. I appeal to your own self-interests. Oh my poor friend, would it not be better for you to be reconciled to the God of heaven, than to be his enemy? What are you getting by opposing God? Are you the happier for being his enemy? Answer, pleasure-seeker: hast thou found delights in that cup? . . . Ah, my friend, “Wherefore dost thou spend thy money for that which is not bread, and thy labour for that which satisfieth not; hearken diligently unto me, and eat ye that which is good, and let your soul delight itself in fatness.” I exhort you by everything that is sacred and solemn, everything that is important and eternal, flee for your lives, look not behind you, stay not in all the plain, stay not until you have proved, and found an interest in the blood of Jesus Christ, that blood which cleanseth us from all sin.